Full Description: Three uncased “Wheatstone” Buddy 8-Note Mouth Organs, one of the first instruments permitted to be made by Wheatstone’s as the restrictions on non-war-related manufactures began to be relaxed after the war. The tiny instruments are stamped in the metal “Buddy, Wheatstone, Made in England”. Each retains its red, wound carrying cord. The Collection has, in its Section NC.1.2.9, many examples from the range of these rather cheap ‘n’ cheerful mouth organs, made just after the 2nd World War at the Wheatstone workshops. 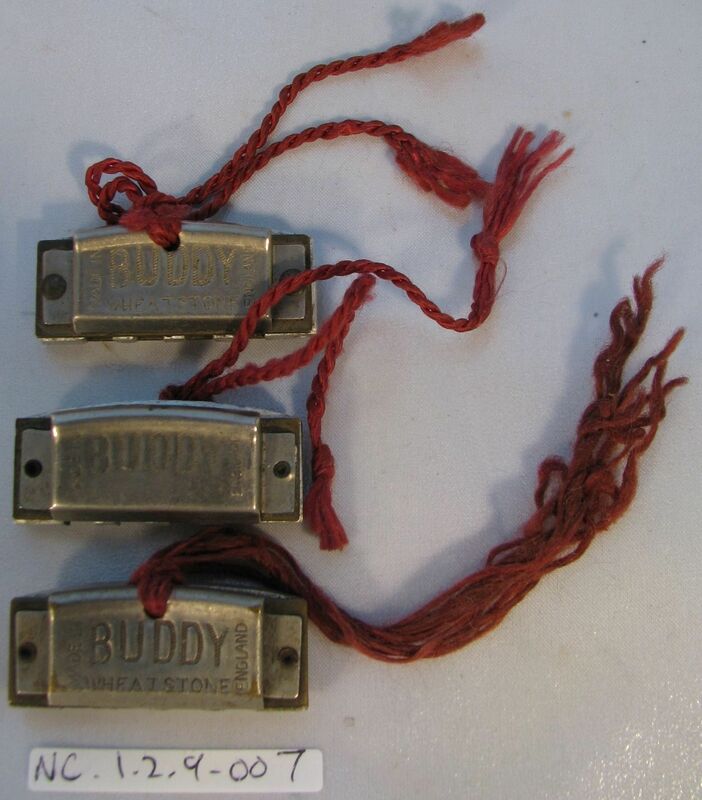 They made “tremolo” models, “Harmonicas”, “Mouth Organs”, “Vampers”, and the 8-Note Miniature “Buddy” Mouth Organ, from mid-1946 to around 1949. Most instruments have their date of manufacture stamped inside the lid of the case.